HP Spectre 13 review (2018): Still the ultraportable king? When it was first introduced in the middle of 2016, HP’s Spectre 13 wasn’t a laptop to be messed with. Successfully nailing the perfect balance of swish looks and light weight without any performance compromises, the original Spectre 13 cemented the benchmark the ultraportables that followed. HP’s flagship laptop made such a strong first impression that it remains at the top-end of our best laptops list almost two years after its initial appearance. Now that its second birthday is fast-approaching, there’s a brand-spanking new model with flashier internals and a fancy 4K screen but can it still hold its own against the current crop of super-slim laptops? 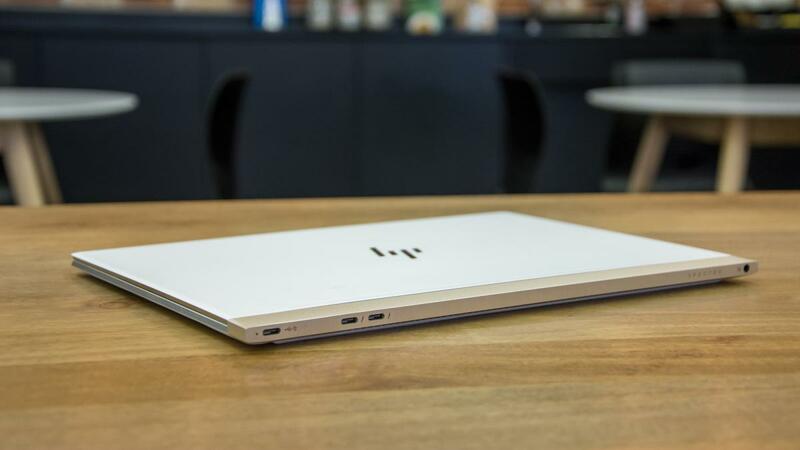 This updated Spectre 13 is still HP’s range-topping ultraportable model. Despite the skinny chassis, this laptop is equipped with Intel’s latest Coffee Lake Core i7 processor and comes with a choice of two RAM and SSD storage configurations, which I will detail below. Another notable addition is the touch-enabled 4K display, which the original configurations lacked, as well as a handful of subtle design changes and a new white and silver paint job. HP’s newest Spectre 13 starts at £1,400 for the Core i7-8550U model, which comes with 8GB of RAM and 512GB of SSD storage. Up that to 16GB of RAM, add a 1TB SSD and you’re looking at a £1,700 beast of a machine. Similarly-specified alternatives include the 2018 Dell XPS 13, which will set you back around £1,549. Apple’s MacBook Pro is also a strong contender, equipped with a seventh-generation Core i5 processor, 8GB of RAM and 256GB of SSD storage for £1,449. 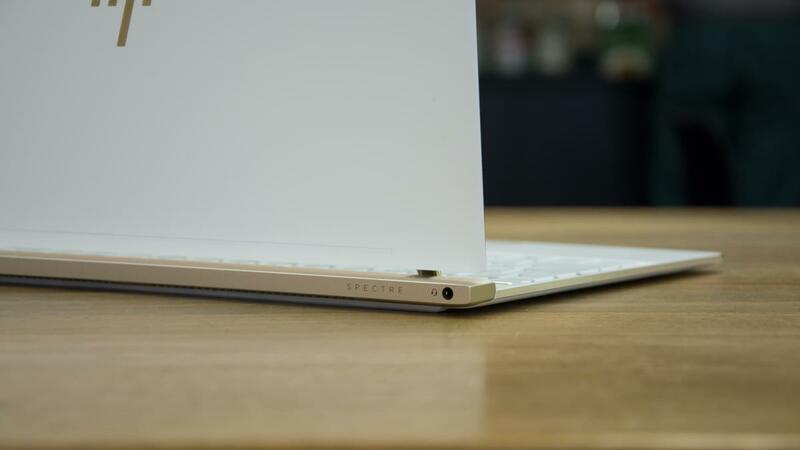 This is HP’s golden boy – almost literally – so it’s no surprise that the latest Spectre 13 looks every bit as gorgeous as the first, with “Pale Gold” detailing on the hinge and surrounding the edges. Every aspect of the design is fabulous: the ceramic white, carbon fibre and aluminium chassis is reassuringly sturdy and, at a mere 10.4mm with the lid closed it’s a good deal thinner than the 2017 Apple MacBook Pro. Weighing only 1.1Kg, it’s a little lighter too. Relegated to the back of the device, next to the fan ports, is a solitary USB 3.1 Type-C port and a pair of Thunderbolt 3-powered USB 3.1 Type-C ports. That’s all you get when it comes to connectivity and you’ll be using one of these to charge the device, which you’ll need to do often but more on that later. As for full-sized USB connectivity, HP includes a USB Type-C to USB Type-A adapter in the box, as well as a USB-C to HDMI dongle for monitor connectivity. Typing is a pleasure on the Spectre 13’s keyboard: the added travel over the super-shallow MacBook Pro’s keys makes a huge difference to typability, and each Scrabble-tile key has enough distance to its neighbour to keep typos to a minimum. The amount of tactile, mechanical feedback is as good as you’ll get from any other ultraportable laptop keyboard, which is impressive for a laptop this thin and light. The wide glass-topped touchpad is equally impressive and, while it is a little on the short side (and would be bigger if HP had shifted the keyboard up ever-so-slightly), it does the job well. My only complaint is that the integrated click action is a little on the heavy side for my liking. The Gorilla Glass-covered 13.3in 3,840 x 2,160 resolution IPS display is wonderful, too. Our X-rite i1 Display Pro colorimeter reported sRGB colour gamut coverage of 95.6% and, at maximum brightness, the HP Spectre 13 reaches 351cd/m2, which makes the display usable in all but direct bright sunlight. Colour accuracy could be better, with an average Delta E of 2.71 and maximum of 6.07 (lower is better), with the Huawei Matebook X Pro’s Delta E figures of 1.27 and 2.53 putting this ultraportable to shame. The screen’s contrast ratio of 1,497:1 is superb, however, which helps images look punchy and solid on-screen. The Bang & Olufsen-branded speaker array at the top of the keyboard is also laudable, producing clear and crisp audio with plenty of volume. With a device this thin, you often get a noticeable amount of rattle and buzz from the chassis when the speakers are cranked up to full but that isn’t the case here, with the Spectre 13 handling Bear McCreary’s booming God of War soundtrack beautifully. 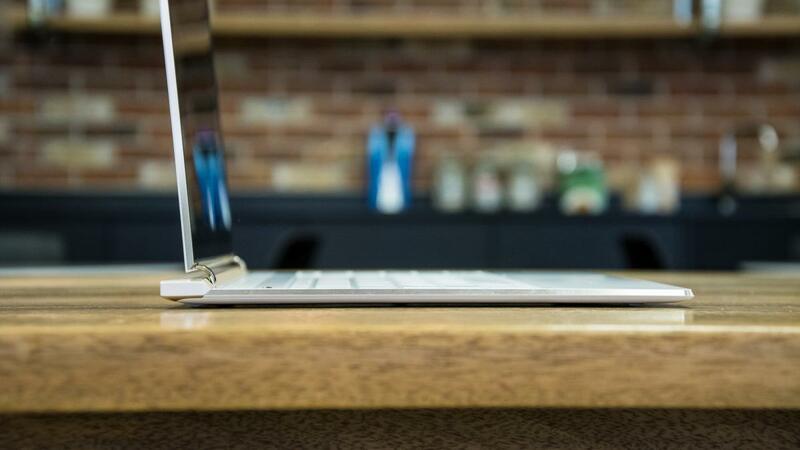 HP’s ultraportable standard-bearer has a surprising amount of power squeezed inside. Intel’s quad-core Core i7-8550U processor powers both configurations – clocked at 1.8GHz with a maximum boosted clock speed of 4GHz – and it was paired with 8GB of LPDDR3 RAM in our review unit, which can be upped to 16GB in the top-end configuration. In our demanding 4K benchmarking tests, the newest Spectre 13 scored 108 in the image-editing test, 68 in video-editing and 46 in the multitasking test. Combine these scores and the Spectre 13 gains an overall result of 63, which is a stonking 46% improvement over the 2016 model. The Samsung-made 512GB NVMe PCIe M.2 SSD in our review unit is nippy, but slightly less impressive, producing sequential read and write speeds of 1,253MB/sec and 1,037MB/sec in the AS SSD benchmark. Apple’s most recent MacBook Pro’s read speeds are more than twice as fast. With Intel UHD Graphics 620 on board, the Spectre 13 is a fairly capable gaming machine, too. I got a slick 55fps out of Dirt Showdown running at 720p with High settings and bumping the resolution up to 1080p still produced a playable 30fps average. The base of the Spectre 13 did get rather toasty when pushed to the limits in this way, but never dangerously or uncomfortably so. Alas, the laptop trips at the final, battery-sized hurdle. It lasted a mere 4hrs 52mins in our video playback test, a result that it a massive 27% behind the 2016 model. I often failed to eke a full day’s use out of it on a single charge, no matter how conservative I was with the applications I was using or the brightness of the screen. Thinner than a MacBook Pro and elegantly designed, the HP Spectre 13 is still up there with the very best of the ultraportables. It’s pricey at £1,400 but this is a laptop that, not only looks the bee’s knees, but also has the performance capabilities to back it up. The Spectre 13’s short battery life does undermine its ultraportable credentials, however, and in that regard you’ll find far better-equipped alternatives elsewhere. Dell’s latest XPS 13, while certainly not as flashy or lightweight, is capable of reaching the ten-hour mark in our tests and the MacBook Pro’s lifespan isn’t to be trifled with, either.